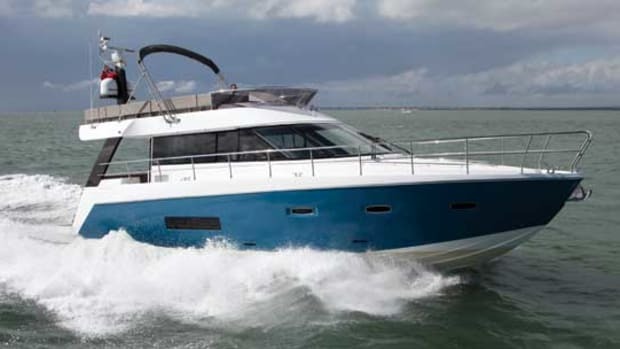 Power & Motoryacht Tested: Belize 54 The Belize 54 combines smart Australian cruising sensibilities with a profile that riffs on the traditional. Get a peek here and see what’s coming. 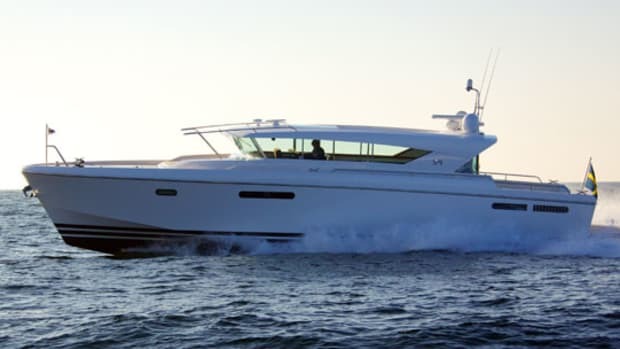 The onboard details, exemplary ride, and casual good looks of the Belize 54 should make quite an impression when the boat’s Sedan and Daybridge versions debut at the upcoming Ft. Lauderdale and Miami shows. In my relatively short and occasionally misspent time on this planet, I’ve managed to pick up a few kernels of wisdom, and one of them is this: Forethought almost always evinces itself. Whenever you are creating something—anything—be it a career, a meal, or even a bed frame from Ikea, the amount of time you put into thinking through the design before you begin to build will inevitably become clear. 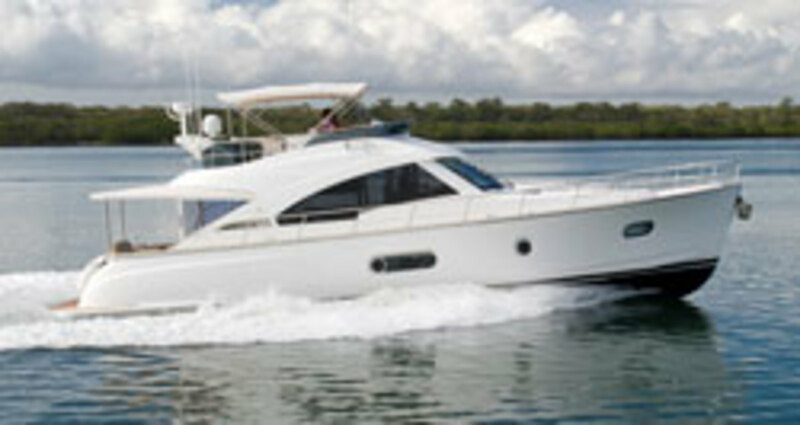 Such is the case with the Belize 54, which I tested last May on Lake Macquarie, a saltwater oasis about two hours’ drive north of Sydney, Australia. 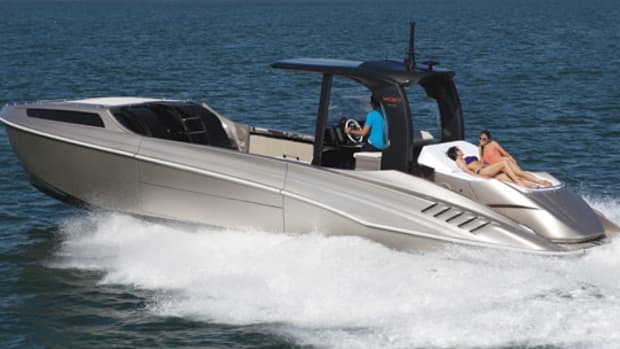 Moxey designed both the Daybridge and Sedan iterations of the 54 (previously known as the 52), and though they’re very similar boats, he designed them separately, so the Daybridge’s titular deck wouldn’t look like somebody just tossed a big ol’ ball cap on the Sedan’s head. It worked. 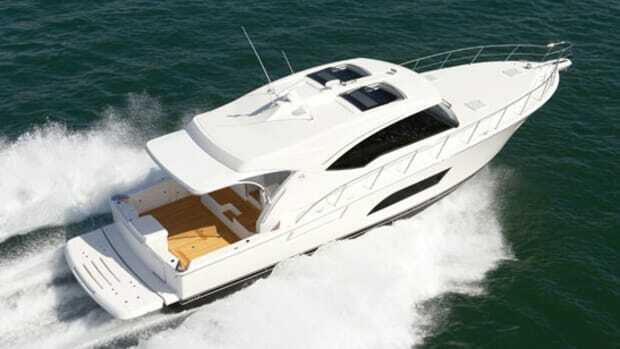 My test boat, the Daybridge, had unusually sleek and graceful lines for a flying-bridge boat. From a distance she looks traditional without being stodgy, and classic while still feeling fresh. Lots of credit for that feeling also belongs with the Taiwanese labor that went into her. Belize chooses to build in Taiwan—with plenty of Aussie oversight—because of the island’s proximity to shipping lanes, its yards’ ability to handle larger vessels, and of course, its concentrated and skilled work force which excels at custom builds. Onboard, the clear attention to custom detail that went into her persists throughout. When I stepped into her cockpit the first thing I noticed was the small bar in the port forward corner. (Give me a break, it was hot. Maybe I wanted a lemonade.) The bar has two floating swivel seats underneath it which are unlike anything I’ve seen on any of the boats I’ve tested—it felt like a megayacht detail. The second thing that stood out was the engineering. The engine room is gelcoated and orderly. Belize clearly labels nearly every component, a highly appreciated virtue when you’re trying to find a pump or track a fuel line in a hurry. Duplex Racor fuel-water separators forward are easy to reach, and that magic word again, forethought, is plainly evident. Back on the main deck, the saloon is notable for a table. Yup. A table. Sure the omnipresent walnut and teak throughout was gorgeous, and the pop-up 46-inch flatscreen was bigger than the one I have in my home. Yes the blinds were electric and the layout was fully customizable, but this table, boy, let me tell you. It lowers to form a daybed with the starboard-side settee, but it doesn’t do so electrically or hydraulically. No, it’s a hand-crank jobber. There are no gaskets or anything of the sort, just two interlocking gears and metal teeth. It makes the table exceptionally strong and sturdy, and it’s a nice nod to both the quality of the build, as well as Belize’s commitment to a salty tradition. Below, a sizable amidships master, was, like the saloon, notable for a somewhat unorthodox detail that acted as a microcosm for the entire area. There’s a starboard-side hanging locker near the head of the king-size berth that is absolutely cavernous. When you peer in, it’s hard to see the back wall. It might actually lead to Narnia. I can’t say for sure. And I don’t know how Belize did it, though I do know that to fit a discreet stowage area that size into a boat of this size is quite a feat of design. After a tour of the accommodations I made my way to the lower helm to see what the 54 could do. 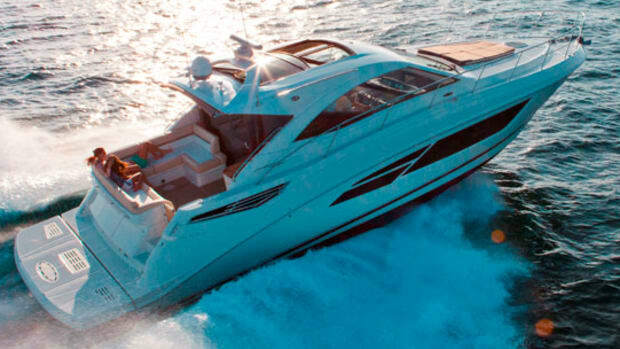 But that would not be before I admired the walnut-framed side windows and twin Raymarine HybridTouch displays. It was a fitting venue from which to drive this boat, a vessel that Belize reps often liken to Bentley automobiles. That’s high praise, but I’d have to say it’s well warranted, because once we got underway, oh my, my, my is this boat fun to drive. Unexpectedly so, I should add. I’m usually a center console/performance boat kind of guy. And while relatively swift with a top speed of 28 knots, this boat wasn’t quite tossing up don’t-tell-my-wife speed numbers. But she was as smooth and nimble as any boat I’ve tested. 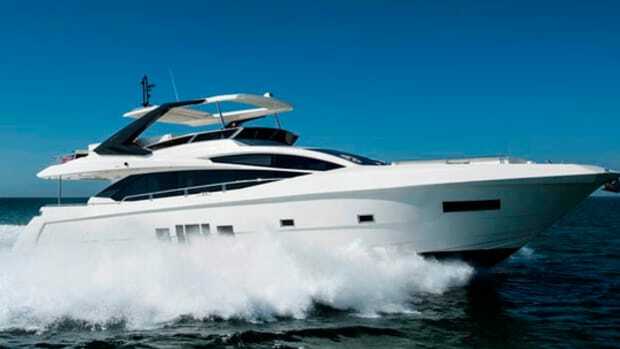 Her twin 600-metric-horsepower Cummins engines with Zeus pods were dialed in so perfectly that I turned her hard-over in about a single boat length, without encountering much heel at all and with little obstruction of sightlines. Her acceleration was smooth and powerful throughout her range, and her trim numbers remained absolutely fantastic. Coming out of the hole she peaked at a measly 3.5 degrees on my inclinometer, and then settled into a comfortable 3 degrees flat in her upper rpm echelons. What’s more, she never breached 77 decibels even running flat out. Though Lake Macquarie was a sublime site for a boat test, I couldn’t help but feel a little twinge for what I was missing out on. 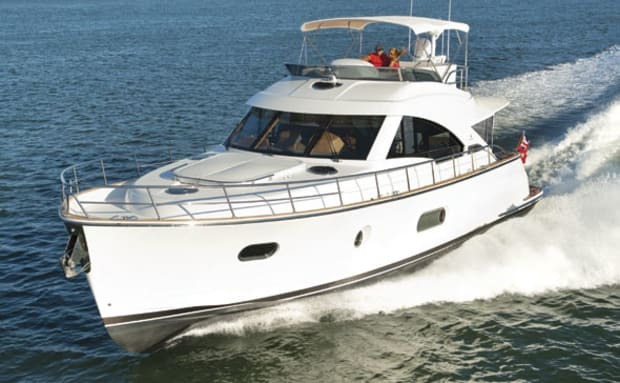 The 54 is, at her core, a sturdy and able Aussie cruiser. She’s got a fine entry in the bow and just a bit of flare to shrug off waves. She’s also got a deep keel to help with tracking at both low and high speeds, as well as a strong, hand-laid hull. These details make sense. Australian sea conditions are typically robust. 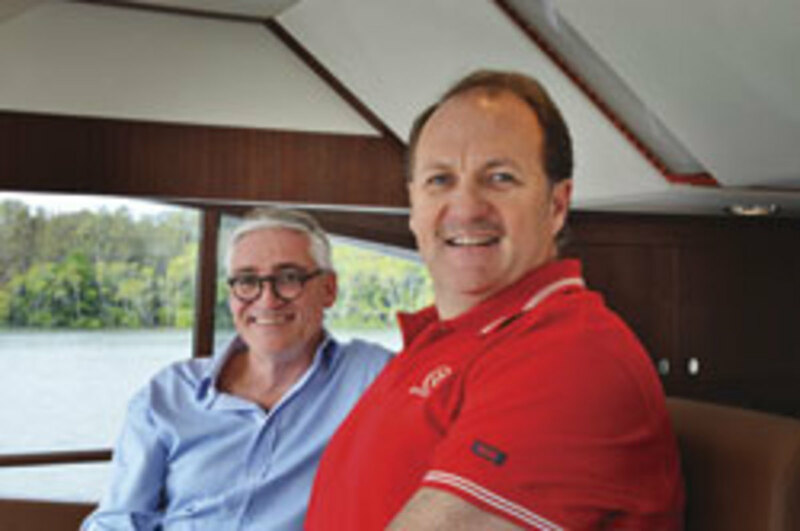 If an owner wants to take his boat from the Gold Coast, where Riviera is headquartered, up to the Whitsunday Islands in the north, for example, he’s in for a 1,200-nautical-mile round-trip trek in waters where 10-foot swells are commonplace. (The trip was once done by a septuagenarian 54 owner, by the way, lest you have questions about the boat’s offshore comfortableness.) 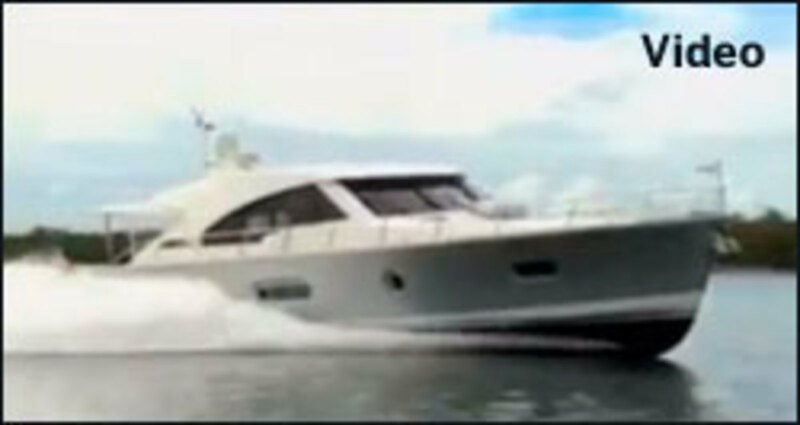 So once she hits the States, I’m sure she’ll be able to handle a jaunt to the Abacos, no problem. 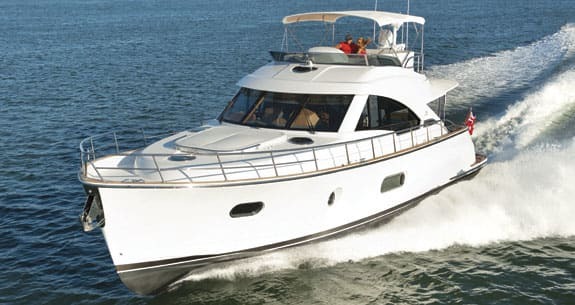 As easy and enjoyable as it was to drive the Belize 54, I’d wager that owning her would be about the same way. 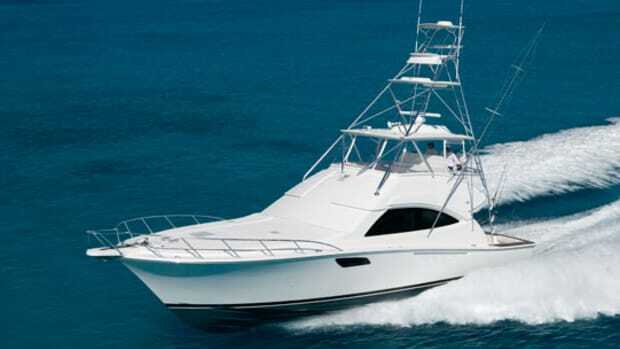 And that’s because as a subsidiary of Riviera, a pillar of Australian boatbuilding, Belize is able to take care of its owners via an extensive service and brokerage network. 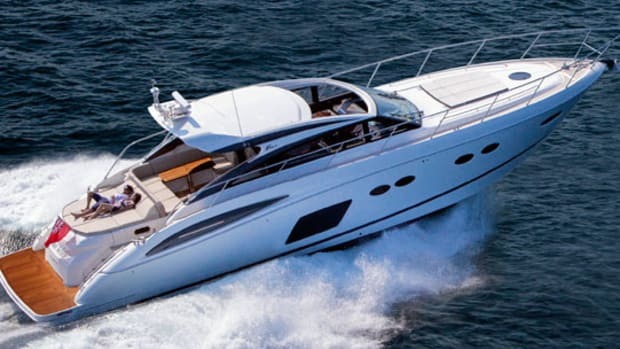 So, couple that service with exquisite onboard detailing, gorgeous lines, and a level of performance that will leave you with a serious jones for manning the wheel, and it becomes pretty clear just how much planning went into what turned out to be one hell of a boat. 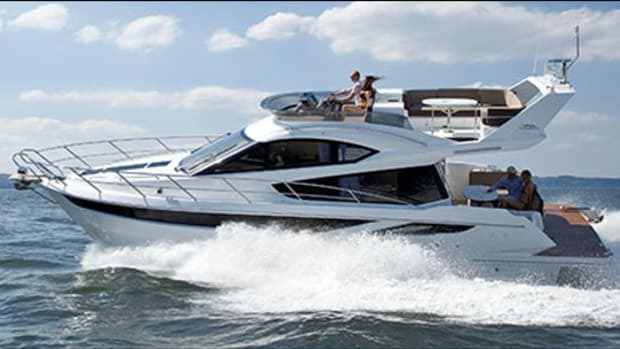 Noteworthy Options: Metallic hull paint, $26,760; Full cockpit awning on oval stainless steel tube,$16,739; Fisher and Paykel Dishwasher, $1,950.